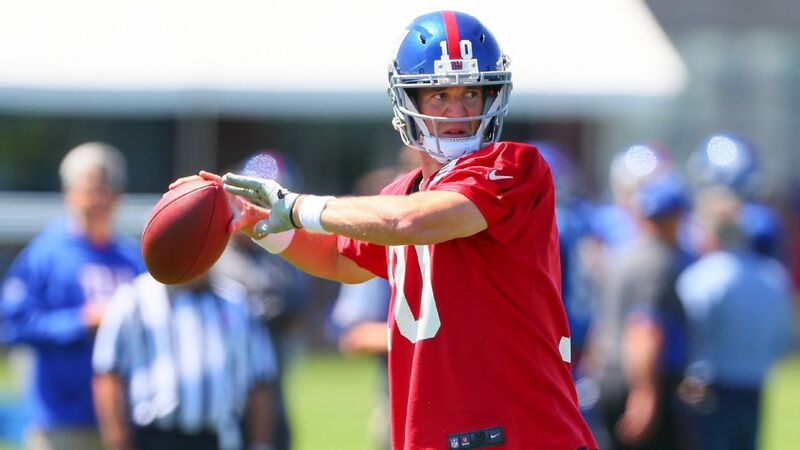 EAST RUTHERFORD, N.J. – Eli Manning expects his potential successor to be added to the roster later this month. He is under the impression that the New York Giants will select a quarterback in this year’s NFL draft. The Giants have the sixth and 17th overall picks in the first round later this month. They’ve met and seen all the top quarterbacks in recent weeks. Even Manning sees where this could be heading. Haskins’ visit is scheduled to stretch into Tuesday. Oklahoma’s Kyler Murray and Drew Lock were also at the Giants facility last week. Coach Pat Shurmur had told ESPN in recent weeks that they intended to have all the top quarterbacks visit. That group included Duke’s Daniel Jones and West Virginia’s Will Grier. Giants ownership explained at the NFL annual meetings that they would like to come out of the draft having addressed the quarterback position. Manning is 38 years old and in the finald year of his contract. But the value of the Giants’ picks has to align with the grade on the quarterback. It makes it more likely the Giants could land a quarterback at pick No. 17 than 6. “I would like to come out of this draft with a quarterback but here is the thing: Show me what the grades are,” co-owner John Mara said recently. “What is the value there? If the top quarterbacks are graded towards the bottom of the first round or even the second round I’m not going to insist we take him at No. 6 or even No. 17. Show me what the value is. That has always been our philosophy on that. The worst thing you can do is try to force the issue and then you end up with a quarterback that isn’t worth taking at that particular spot. Manning understands part of his role this season could be working alongside another young quarterback. It’s nothing new. The Giants drafted Davis Webb in the third round two years ago and Kyle Lauletta in the fourth round last year. Webb is now on the Jets. While Manning doesn’t necessarily view his job as being a mentor, it doesn’t mean he won’t be willing to help. Webb has consistently raved about working alongside the two-time Super Bowl winner. Manning abides by the lead-by-example philosophy. Manning’s concentration now is on being a good teammate and getting the team ready to win football games. He told the Giants immediately after the season about his desire to continue playing even after a rough season. That came during what general manager Dave Gettleman described as a “no-holds barred” meeting. Manning said he wasn’t told about his fate by Gettleman and coach Pat Shurmur until the last month or so. That is when the Giants made their intention of having him return as the starter clear. Nobody seems all that concerned that it’s the final year of Manning’s deal and ownership wants to take a wait-and-see approach with his future. Manning admitted his concern is with the present, not the past or the future. Having been in the league for 16 years, he wasn’t even surprised by the recent trade of star wide receiver Odell Beckham Jr., which he claims to have found out about on TV when it came scrolling across the ticker and texts started crowding his inbox. He apparently won’t be surprised by addition of a quarterback in this year’s draft either. The Johnson County District Attorney’s Office announced Wednesday that Hill and his fiancee, Crystal Espinal, will not be charged. District Attorney Stephen M. Howe said that although he believes a crime occurred, the evidence in the case doesn’t clearly establish who committed the crime. Although Hill referred to his son in his statement, neither the District Attorney’s Office nor police have identified the child referenced in the police reports. Attorneys for Hill also released a statement Thursday, saying Hill has maintained he was “innocent of any crime” and that he has been cooperating with authorities. On Wednesday, Howe said officials were “deeply troubled” by the situation. Officers had previously been called to Hill’s address March 5 to investigate a report of child abuse or neglect. Hill’s name was listed on that report. According to Overland Park police, the case was closed three days later when prosecution was declined. Hill is still subject to discipline by the NFL. The Chiefs issued a comment late Wednesday acknowledging the district attorney’s decision but declining further comment, citing the ongoing investigation by the Department for Children and Families. Hill, a three-time Pro Bowl selection, caught 87 passes last season and ranked fourth in the NFL in both receiving yardage (1,479) and touchdown receptions (12). While at Oklahoma State, Hill was convicted of domestic assault and battery after punching and choking his girlfriend. He was sentenced to three years of probation and ordered to undergo anger management classes. He was dismissed from OSU and finished his collegiate career at West Alabama. He completed probation in 2018, and his conviction was dismissed. ESPN’s Adam Teicher contributed to this report. 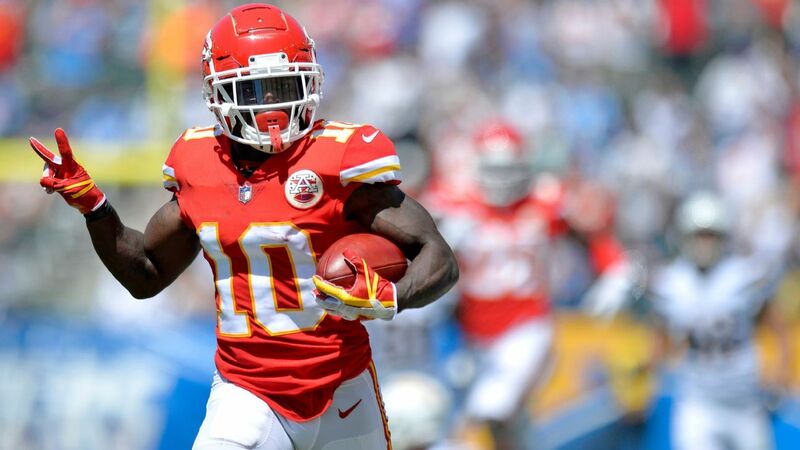 The Johnson County (Kansas) District Attorney’s office has declined to file charges against Kansas City Chiefs star wide receiver Tyreek Hill or his fiancée, it was announced Wednesday. District Attorney Stephen M. Howe said that although he believes a crime occurred, the evidence in the case doesn’t clearly establish who committed the crime. 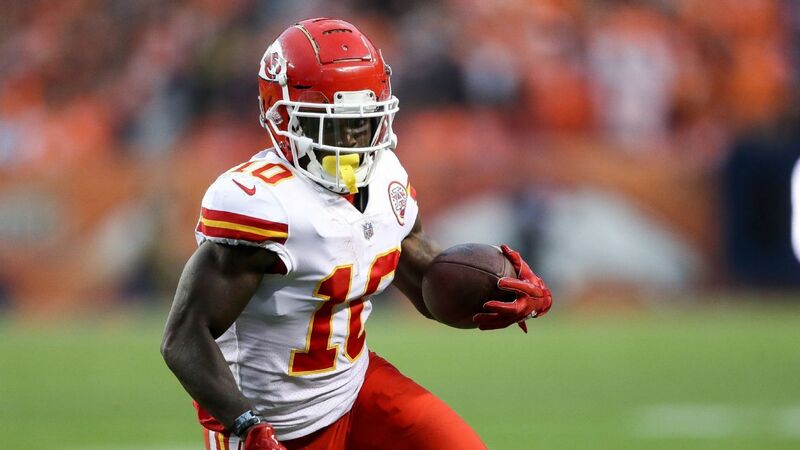 Howe said Hill’s status as a star NFL player had no bearing on his decision and that he has not spoken with the Chiefs organization, which was aware that the investigation was taking place. Hill is still subject to discipline by the NFL. Hill participated alongside teammates during the Chiefs’ voluntary offseason conditioning program April 14. Two hundred fifty-four names will be called on the stage in Nashville, Tennessee, over the course of three days this week. And many of those 2019 NFL draft class prospects come with fascinating backgrounds, pro connections and interests. A relative of a jazz music legend (No. 24)? A film buff-turned-linebacker (No. 35)? A boxing champion’s son (No. 15)? Mike Bibby’s nephew (No. 48)? How about a track and field record-holder (No.12)? Let’s get to know some of the players who could be drafted Thursday, Friday and Saturday. Note: Jim Carr of ESPN’s Universal News Group, TJ Berka of ESPN’s NFL team and ESPN Stats & Information all provided background research for this story. 1. Kentucky’s Benny Snell Jr. was born to play running back. His father, Ben Snell, played in the XFL — and actually was the one who came up with the famous “He Hate Me” nickname — and his uncle played in the NFL for the Jets. 2. Offensive tackle Kaleb McGary has had three heart procedures. 3. Rashan Gary, the super-athletic defensive end out of Michigan, already created his own sports agency, Rashan Gary Sports. The agency represents Gary and Bowling Green defensive back Montre Gregory. 4. Kentucky cornerback Lonnie Johnson Jr. was originally supposed to play at Ohio State, but an ACT score he needed to count to be academically eligible had his last name spelled J-O-H-N-N-S-O-N, which negated the score. He ended up in junior college for three years before ultimately playing for the Wildcats. Lonnie said it was a computer mishap. 6. Way before linebacker Devin Bush was tackling running backs at Michigan, his father, Devin Bush Sr., won the national championship in 1993 at Florida State, was a first-round draft pick in 1995 for the Atlanta Falcons and later won Super Bowl XXXIV with the St. Louis Rams. Devin Bush is a linebacker from Michigan who was named the Big Ten’s Defensive Player of the Year in 2018. 7. Josh Jacobs and Damien Harris could become the sixth and seventh Alabama running backs selected in the first or second rounds in the Nick Saban era, joining Mark Ingram, Trent Richardson, Eddie Lacy, T.J. Yeldon and Derrick Henry. 8. JJ Arcega-Whiteside, a highly regarded receiver at Stanford, was born in Zaragoza, Spain, and his parents were professional basketball players in Europe. 9. The Bosa family can join the Manning family as the only families in NFL history with a father and two sons who were first-round picks. Ohio State DE Nick Bosa is the younger brother of the Los Angeles Chargers‘ Joey Bosa. Their father, John Bosa, and uncle, Eric Kumerow, were defensive ends for the Miami Dolphins in the 1980s. 10. Old Dominion has never had a player drafted, but it should have two this year. Oshane Ximines is a highly regarded pass-rusher, and Travis Fulgham is a late-round receiver. Oshane Ximines is a defensive end from Old Dominion who was first-team Conference USA in 2018. 11. Michigan RB Karan Higdon spent last summer working as an intern for BlitzPrep, a company that helps former pro football players transition to new careers. 12. Parris Campbell‘s speed is well known since the Ohio State wide receiver dazzled with a 4.31 time in the 40-yard dash at the combine. But he is also the state of Ohio’s high school indoor track 60-yard-dash record-holder (6.85 seconds). 13. Interested in quarterbacks with NFL ties? The uncle of Boise State’s Brett Rypien is former Washington quarterback Mark Rypien, the MVP of Super Bowl XXVI, and Vanderbilt QB Kyle Shurmur‘s father, Pat, is the coach of the New York Giants. 14. USC outside linebacker Porter Gustin consumes more than 10,000 calories a day, carrying a small blender with him all day and blending most of his meals into shakes. He does 300 pushups and 300 situps each night and drinks more than two gallons of water per day. 15. Elijah Holyfield is a son of former heavyweight boxing champion Evander Holyfield. Elijah was a boxer himself until he was 13 years old. 16. A two-time state champion wrestler, Temple cornerback Rock Ya-Sin got his nickname from his wrestling coach. His real first name is Abdurrahman. Rock Ya-Sin was a first-team All-American Athletic Conference selection at corner back as a senior at Temple. 17. When drafted, Penn State RB Miles Sanders will become the 14th player from Woodland Hills High School in Pittsburgh to play in the NFL. Jason Taylor and Rob Gronkowski are also on the list. 18. Ole Miss slot receiver A.J. Brown was drafted by the San Diego Padres in the 19th round of the 2016 MLB draft. He signed with the Padres but has yet to play in a minor league game. 19. San Jose State tight end Josh Oliver‘s uncle, Clancy Oliver, was an NFL defensive back, and his second cousin might be remembered by baseball fans; Darren Oliver was a relief pitcher for 20 MLB seasons. 20. Between his sophomore and junior seasons at Stanford, linebacker Bobby Okereke interned in the office of former Secretary of State Condoleezza Rice. 21. Arizona State wide receiver N’Keal Harry and Washington corner Byron Murphy are good friends, meeting when they were freshmen in high school. They played together during their sophomore high school season, and Harry actually lived with Murphy for a few months during that year. 22. Before Mark Fields was making plays as a corner for Clemson, his father — also named Mark — was the 1994 Pac-10 Defensive Player of the Year at Washington State, a first-round NFL draft pick and two-time Pro Bowler. Mark Fields is a cornerback out of Clemson who helped the Tigers win two national championships during his career. 23. Wide receiver Greg Dortch missed the last month of his 2017 season at Wake Forest after he punctured his small intestine diving onto a pylon. Before he went to the hospital for surgery, he scored two more touchdowns in that game. 24. Most people probably assumed Boston College defensive end Wyatt Ray would have been a musician rather than NFL player; he is a grandson of jazz musician Nat King Cole and nephew of singer Natalie Cole. 25. Buffalo wide receiver Anthony Johnson joins plenty of talented family members in the NFL. Houston Texans defensive end Jadeveon Clowney, Texans cornerback Johnathan Joseph and former Buffalo Bills safety Jonathan Meeks are his cousins. 26. Devin White owns seven horses. Ricky Bobby was his first, but the LSU linebacker’s favorite is Daisy Mae. 27. This draft class has a Michael Jackson (corner out of University of Miami) and a Joe Jackson (DE also from Miami). There’s also a Michael Jordan (Ohio State guard) and Lil’Jordan Humphrey (Texas WR named after M.J.). And that Josh Allen high on draft boards isn’t the Buffalo Bills QB; it’s the playmaking edge rusher from Kentucky. Oh, and there are two David Longs: West Virginia linebacker David Long Jr. and Michigan corner David Long. 28. Remember the 13-year-old seventh-grade QB who got national attention by committing to USC in 2010? It was David Sills V. But when USC and then West Virginia wanted him to change positions, he became a wide receiver for the Mountaineers. 29. Irv Smith Sr. (Notre Dame) was the No. 20 draft pick by the New Orleans Saints in 1993. His son, Irv Smith Jr., could also be a Day 1 selection and would be the third Alabama tight end drafted in the first round (Ozzie Newsome and O.J. Howard). Irv Smith Jr. is a tight end out of Alabama who caught seven touchdowns for the Crimson Tide during his final season. 30. What makes Auburn corner Jamel Dean‘s 4.30 40 time (fastest among all CBs this year and second-fastest overall) even more impressive? He tore his right ACL, the meniscus in his right knee and his left ACL over his high school and college football careers. 31. Offensive tackle Maurice Simba of Concordia was separated from his parents for 15 years after they left the Democratic Republic of the Congo for Montreal when he was 3 years old. He was raised by his grandparents before being reunited with his parents in 2012. 32. During the 2017 offseason, USC inside linebacker Cameron Smith worked on a vineyard that specializes in pinot noir. 33. UNC offensive tackle William Sweet created a compression sleeve to reduce swelling after one has ACL surgery and is attempting to patent it. 34. 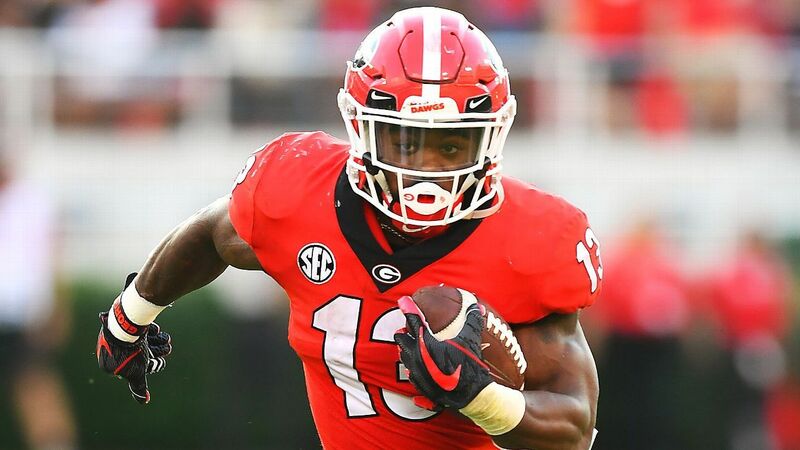 Georgia receiver Riley Ridley played against his older brother, Calvin Ridley of the Atlanta Falcons, in the 2018 College Football Playoff championship game. Now they might play against each other in the NFL. 35. Before he was playing inside linebacker for the University of Washington, Ben Burr-Kirven and his brother, Carter, grew up shooting movies and writing scripts together. Film remains a big part of Ben’s life. 36. It remains to be seen who will pass-protect for Oklahoma QB Kyler Murray in the NFL. But in high school, it was a pair of offensive linemen who are also in this draft class: Ole Miss’ Greg Little and Oklahoma’s Bobby Evans. 37. West Virginia linebacker David Long Jr. is a son of David Long Sr., a former pro heavyweight boxer. The elder Long went 12-5-2 and once fought Deontay Wilder. 39. Before Chase Hansen played outside linebacker for Utah, he went on a two-year Mormon mission to Australia, going door to door with a pro rugby player. 40. Alabama linebacker Christian Miller‘s dad, Corey, played linebacker at South Carolina and was a sixth-round pick of the New York Giants in 1991. 41. Hall of Fame cornerback Herb Adderley won five titles with the Green Bay Packers and Dallas Cowboys from 1961 to 1972 and is Delaware safety Nasir Adderley‘s twice-removed first cousin. Herb learned that the Packers picked him No. 12 overall in the 1961 NFL draft by telegram. 42. Wonder why Chauncey Gardner changed his name to Chauncey Gardner-Johnson? Although Brian Johnson is technically his stepfather, the Florida defensive back said Brian is like a father to him. So on New Year’s Eve 2017, he tweeted the name change as a tribute, and soon after made it official. 43. Miami safeties Jaquan Johnson and Sheldrick Redwine grew up in the same Richmond Heights neighborhood and played football together for the Richmond Giants, Killian High and the Hurricanes. They even roomed together. 44. Eastern Michigan defensive end Maxx Crosby‘s older brother, Myles, is a Ford model who briefly played defensive back at SMU. 45. Michigan State safety Khari Willis was rushed to the hospital when he was a toddler after he developed a fever and became unconscious. Doctors determined Willis had an adenovirus that can be fatal. It took three days, but Willis regained consciousness. 46. Three Washburn players have been drafted (Cary Williams, Trey Lewis and Troy Stedman) but none before the sixth round. Cornerback Corey Ballentine hopes to be the first. Byron Murphy is a defensive back from Washington who earned first-team All-Pac-12 and second-team AP All-America accolades. 47. Iman Marshall, a corner out of USC, played for former NFL linebacker Antonio Pierce at Long Beach Poly. The school also produced JuJu Smith-Schuster, Jurrell Casey, Jayon Brown and DeSean Jackson. 48. Washington corner Byron Murphy was a standout high school basketball player, but that shouldn’t be a surprise — his uncle is Mike Bibby, a former NBA point guard. 49. When he was 15 years old, Azeez Al-Shaair (ILB at Florida Atlantic) saved his two younger brothers and niece from a kitchen blaze that burned his grandmother’s house down. 50. BYU defensive end Corbin Kaufusi‘s mother, Michelle, became the first female mayor of Provo, Utah, in January 2018.